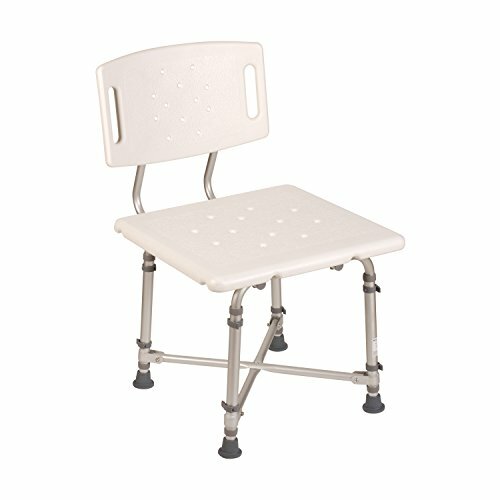 This sturdy HealthSmart shower chair will provide welcome relief and increased independence for those who have trouble standing or worries about falling in the bathtub. Shower with confidence knowing you have a stable place to sit. This bath chair will make showering easier and safer for people with disabilities, older people or those recovering from surgery or injuries. The chair’s frame is made from aluminum which is incredibly strong yet lightweight. The shower chair weighs only 13.5 pounds yet can support up to 500 pounds. The textured seat has drain holes so water won’t build up. And the suction cup rubber tips are slip resistant, giving the chair firm footing on wet surfaces. You’ll have peace of mind knowing your shower bench features germ-free protection that helps shield against odors, molds and bacteria. It’s protected by our patent-pending BactiX natural antimicrobial which disrupts the growth of harmful germs, including Staph and E.coli. It begins working on contact, never wears off and is effective for the life of the product. PROTECTS AGAINST SLIPS AND FALLS. This sturdy bath and shower chair won't let you down when it comes to support. It can hold up to 500 pounds! Shower with confidence knowing you have a sturdy chair to sit on. STRONG YET LIGHTWEIGHT. The frame is made from anodized aluminum which is incredibly strong yet lightweight to lift and carry. It weighs only 13.5 pounds. No tools required for assembly! BUILT-IN GERM PROTECTION. You'll have peace of mind knowing your shower bench features germ-free protection that helps shield against odors, molds and bacteria for the life of the product. ADJUSTABLE HEIGHT SEAT has a textured, non-slip surface and drain holes to protect against water buildup. Slip-resistant rubber tips help the chair stay in place. LIMITED LIFETIME WARRANTY. We've got you covered so you can buy with confidence! If you have any questions about this product by HealthSmart, contact us by completing and submitting the form below. If you are looking for a specif part number, please include it with your message.